I am pleased to introduce Kee Yazzie, a younger Navajo/Hopi metalsmith from Winslow, Arizona, whom I've been working with for at least 10 years. Kee Yazzie brings much life experience to his jewelry making, which in turn, gives his jewelry a special depth. Kee went to school in Provo, Utah where he studied architectural and drafting design - skills that most likely carried over into Kee's present day jewelry design. At Brigham Young University, Kee Yazzie studied linguistics until he became fluent in Thai and Laotian, a tool that he used intensively for two years in Boston, Massachusetts and Providence, Rhode Island, where he served as a missionary for the Church of Jesus Christ of Latter-day Saints. 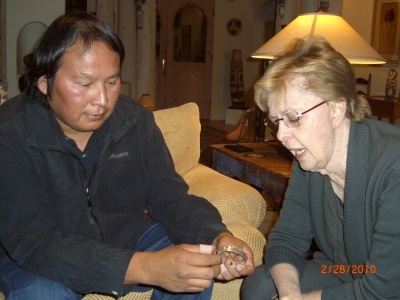 After returning from his mission work, Kee became interested in jewelry making, for he had long admired the work of American Indian artists like Norbert Peshlakai and Mike Bird-Romero. Fortunately, Kee was able to learn from his friend, Ray Scott, an artist who Kee Yazzie worked with for a year. Much of Kee’s metalsmithing talent was, however, developed by trial and error and watching his artist friends work. Kee’s own father was a silversmith too, but Kee never received any formal instruction from his dad, maybe just some jewelry artist genes. Kee considers 1995, when he had finally acquired his own jewelry-making tools, to be the true launch of himself as an artist. Kee’s resulting style is one of wonderful surface images created through complex overlay, cutouts, stamping, and appliqué. Sometimes Kee even puts designs on the back of his work. Inspired by the rock art walls that Kee Yazzie saw east of Keams Canyon when he was younger, he began to depict these petroglyph images on his jewelry – something that distinguishes his pieces from that of other American Indian jewelers. The resulting jewelry is quite unique and very beautiful. He works in silver, gold and sometimes incorporates fine natural turquoise stones. A pivotal moment for Kee as an artist was in 1999 at his very first Heard Show where he won first place in his category and completely sold out in an hour. Interestingly, that’s the only time that Kee Yazzie has ever entered the Heard Show. If you haven’t already heard of Kee Yazzie, please enjoy his special jewelry. 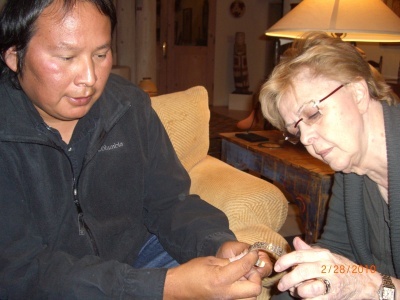 Kee Yazzie is showing me one of his silver overlay bracelets.